Rub the eisbeins with the harissa spice then brush with the apricot jam. Place the eisbeins in a deep casserole dish, add the orange juice and cover with the water. Cover the dish with two layers of foil and bake for two hours. Place the orange zest, water, sugar, vanilla and ginger in a saucepan and stir well until the sugar has dissolved. Simmer over a medium heat for 10-15 minutes. Remove from the heat and carefully pour through a sieve into a mixing bowl to remove the ginger pieces, then stir in the orange marmalade and leave to cool. Remove the eisbeins from the oven, drain the water and generously brush on the orange and ginger glaze. Return the eisbeins to the oven for 15 minutes, allowing the glaze to become golden and sticky. Place the sweet potatoes and onions on a baking sheet and drizzle with olive oil. Season with the thyme, salt and pepper and bake for 15-20 minutes until cooked. On a large serving platter, roughly layer the salad leaves, grapes and feta, finishing with the sweet potatoes and onions. 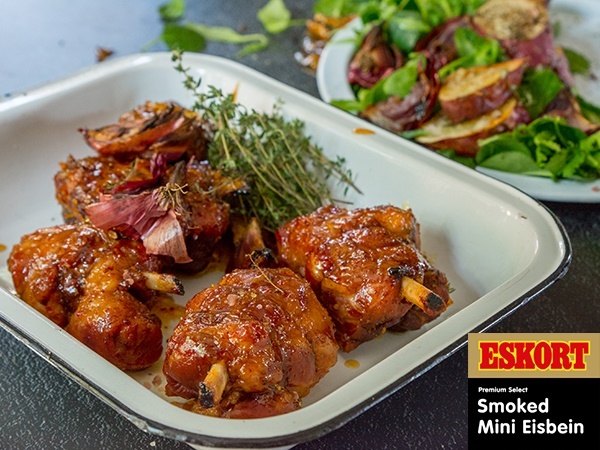 Serve the mini eisbeins with the salad dressed with the pan juices for extra flavour. Bake the sweet potatoes in the oven while the eisbeins are cooking to reduce the total cooking time. I'm a 51 year old woman looking to meet men between the ages of 45 and 56.